Boy, to have lived back then! 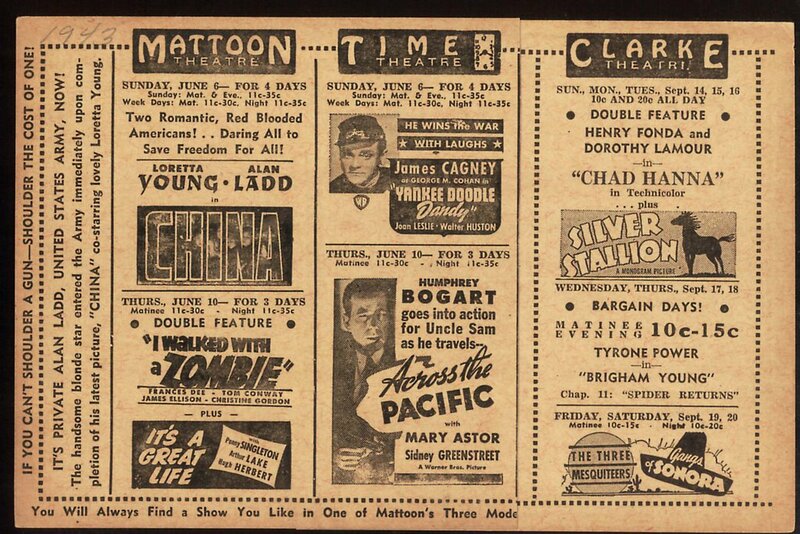 Seeing shows like these, at a time when people really got excited about going to the movies. Some of us were just born too late, I guess. 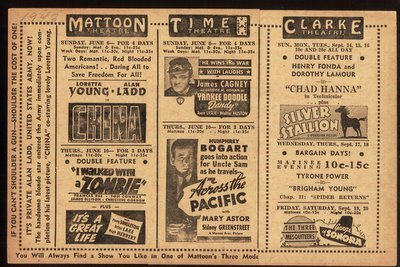 The flyer shown here is actually on cardboard stock, with movie info on both sides. It’s a co-op ad among the three local theatres in "Mattoon" (where is that? ), and was distributed gratis to patrons and townsfolk. Friends who grew up in that era tell us that these things were mailed out as well. Must have been fun checking the mailbox for such treats. Note the sidebar about Alan Ladd going into the Army right after finishing China, and imagine getting into the show for a dime! And seeing pictures like Across The Pacific and Yankee Doodle Dandy for eleven cents!! Now they want seven or eight dollars to see Rumor Has It. And it is on that happy note that we adjourn for breakfast. Matoon is in Illinois and is famous for-- right around the time of your ad-- the Mad Gasser of Matoon. Boy do I relate to your enthusiasm for this golden age of movies! I was born in 1977, and ever since I was a kid I've preferred classic films to the current crop of crap. I'm fascinated by that era (1930s-40's, especially) and often feel I was born at the wrong time. I just found your blog today, thanks to a link from the TCM forums. What a treasure trove you're sharing! I can't thank you enough! Not too many folks are this generous with movie memorabilia - you ROCK! P.S. I had no idea blogs like this existed...I was under the impression bloggers only shared trendy new music, and so I've ignored the whole blog phenomenom. What a fool I've been.